The ever-brilliant Madlib has helped hip-hop with his many different outlets in the past few years. Whether it's his work with former bandmates Lootpack, the silly high-pitched fun of Quasimoto or his highly regarded production skills, Madlib is a chameleon with many colors still yet to be revealed. His recent work with Jay Dee, the Jaylib project, garnered many rave reviews, yet he managed to simultaneously release what may be his most adventurous work yet. Working with the legendary jazz label Blue Note, Otis Jackson (his real name) has cut and pasted, rearranged and reshaped classic pieces of the label's catalogue. 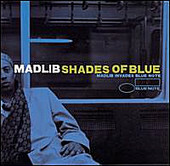 While his reputation may be as a loose and unpredicted cannon, Madlib has treated these timeless works with the utmost respect. Using tracks by artists like Donald Byrd, Horace Silver and Wayne Shorter, the modifications maintain the lively essence of the original.